Have you ever longed to be someone else? Now? I find a fault with all the women I wished to become in the past. Things in their lives I would not dig. 1. Cleopatra: Someone always trying to kill her, then suicide by an asp. Yuck. 2. Movie stars: Always being under a microscope, gossip, no privacy. Yuck. 1. 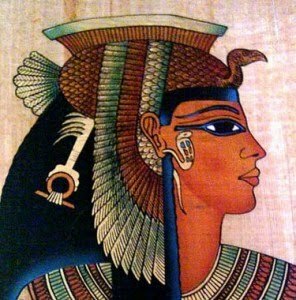 Cleopatra: I was facinated by her ability to lead…the confidence she possessed. 2 Judge Judy: Speaking in a clear, bottom line way. 3. Carole Lombard: The life of the party, warm, witty, glamorous. 4. Elle Woods: Disciplined, warm, loving, always looking fabulous. Her personal initiative. She never judges. I discovered what I loved so much in these women—were in me. Waiting to come out and play. Kinda cool, huh? So who do you admire and why? Is that a part of you that wants to come out deep in your soul? What ways can you help her come out? Copying a style? Taking a leadership class? Practicing speaking directly? That’s a lot to think about. Maybe just pick one woman and see what really turns you on about her and explore. And visit the Amazing Women catagory on this web site for more inspiration. WOMEN ROCK! I love all of your choice in the women that inspired you! I love your inspirations: Cleopatra and your gorgeous new gold snake bracelet!